FOR HIRE – the UWS Creative Media Academy Seminar Room. We are pleased to introduce our new facility for hire, the UWS Creative Media Academy Seminar Room, a partnership between Film City Glasgow and University of West of Scotland (UWS), which also marks the launch of two new Masters programmes in Filmmaking and Screenwriting to be delivered from the facility. - perfect for presentations, conferences, or launch events. 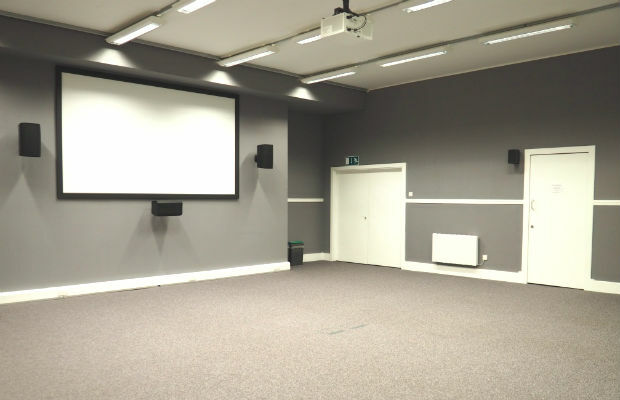 The 1,000 sq ft Seminar Room includes industry standard AV equipment suitable for most playback formats, and comfortably fits 50 people (theatre style layout), 24 people (banquet style), 16 people (classroom style) or 12 people (boardroom style). To date the room has hosted the Scottish Film Summit, the Scottish Film Talent Network Workshop Tour, various networking and launch events, symposiums, and short film screenings. It is immediately adjacent to the Film City Glasgow café which is open Monday to Friday, 9am - 4pm, and our café operators offer a range of event catering which can be served in the Seminar Room or in a near by break–out space, and will operate outside of normal business hours to cater specifically for your event. AND here's the techy bit.. the projector is a Christie DHD600-G DLP 1920 x 1080 6600 Lumen with standard HD lens. The screen size is 16 x 9, 3000 x 1.69 and audio includes Yamaha AV receiver, Tannoy 7.1 surround, and Yamaha Compact Subwoofer. DVD/Bluray playback is available, with a further interface for standard external inputs such as HDMI and VGA. Room hire includes 50 conference style seats and 8 conference style tables, wi-fi or fixed ethernet access to our 100MB leased line, cloakroom, and on site Duty Manager to look after your event. Out of hours access will be charged at an additional £10 ph.